Apple has added music control in the control center since releases of iOS 11 for iPhone and it gives user access to easily control the music play. The music control app in the control center is in fixed place and user doesn’t have option to hide or remove it from the control center. It is also accessible from the lock screen if you have allowed access from lock screen. This may be good feature in many cases to put music control in control center but for many iPhone users this is annoying and unwanted. As accidental touch can cause music running to stop or start unintentionally. Eg If my iphone is in my pocket and I get a notification the screen lights up, music is there and now while in pocket it might get a touch on music widget and can make music go random actions. This is annoying for music, but when listening to an audio books with hour long tracks this is very annoying indeed. 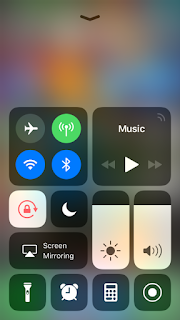 But there doesn’t seem like there’s a way to remove the music widget from the iPhone control center screen but there are some workaround you can use to avoid any inconvenience due to this feature. Turn off raise to wake feature in your iPhone and this will not turn on the screen now and then in your pocket causing accidental touch. The one other thing that you can try, which affects somewhat more than just this, but you can use DND while you are listening to something so that notifications don’t turn on your screen. Another tweak is to turn off lock screen Notifications. Should “silence” the lock screen other than phone calls.